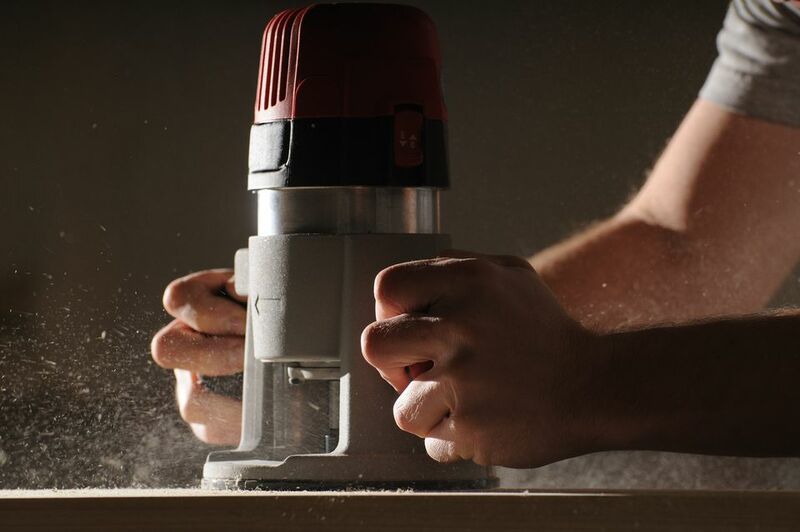 When routing strongly-grained wood such as oak, particularly when going against the grain, the wood can easily splinter or have chunks taken out, leaving a problem that has to be addressed rather than a cleanly cut profile. What steps can be taken to avoid these problems? The first thought to keep in mind is to use sharp, quality bits. Cheaper bits will likely have cheaper carbides, meaning that the bit may not cut as cleanly as a better bit. To give you the best results, always purchase the best bit you can reasonably afford. Keep in mind that more expensive doesn't always mean better, but as a general rule of thumb, a $60 bit is going to perform far better than a $15 bit. For some cuts such as a straight cut, a spiral bit will cut cleaner than a straight-carbide bit. The drill bit-like action can produce a nice, splinter-free cut. If possible, use a bit with a 1/2" shank rather than a 1/4" shank. The 1/2" shank-bit will be less prone to chatter (think of chatter as the bit vibrating or wobbling due to the high speed at which the bit turns), which will, in turn, produce a better cut. 1/2" bits typically have better (and sometimes more) carbides as well. Next, make sure that the carbides are sharp and free of any nicks that would leave an uneven profile. You should also make sure that the bit is as clean and clear of the pitch as possible. Keeping the bits clear will reduce heat in the bit. A quick word about bit sharpening: In the case of multi-carbide router bits, it may be wise to have them professionally sharpened rather than trying to sharpen them (or even clean them up) on your own. The reason is that if one carbide has more material removed than the carbide on the opposite side of the bit, the slight weight imbalance will create chatter. NOTE: If you were to use a 3/8" straight cutting bit to cut a flute (or dado) and then found that the width of the groove cut was 13/32", your bit would be cutting 1/32" wider than desired due to the chatter. This is referred to as "runout." When cutting woods prone to chipping or splintering, you'll likely have better luck if you route with the grain rather than against it. This poses a bit of a problem when you need to route end-grain. In that event, cut the ends first. Any tear-out on the edges will likely be cleaned up when you cut the side edges with the grain afterward. TIP: When cutting edge profiles on end grain, you might try positioning a piece of scrap material at the end of the edge being routed. If the bit continues past the workpiece on another board, it is less likely to grab and splinter the final corner of the workpiece. If you find that routing the entire profile that in one pass of the router causes splinters, try making a few passes, removing only a little bit of stock at a time. Your bit will be much less likely to grab and tear if it has less to grab onto. When routing a profile that is prone to splintering, you might want to increase the speed of the router motor a bit more than you normally would. You should typically follow the standard router bit speed chart for the profile diameter of bit you've chosen, but you can safely increase the speed (say 10 to 20%) when you're worried about splinters.